Don't tell an egg a joke unless you want it to crack up! 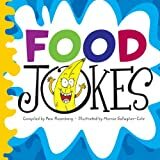 Food Jokes is the perfect kid-friendly compilation of quips that will keep the entire family giggling at breakfast, lunch, and dinner. Who said eating should always be a bore? These jokes will make meal time fun and entertaining for the whole family! Breakfast, lunch, and dinner can be more than fuel for your body- instead make each meal engaging with light humor. Everyone likes to laugh! Knock, knock. Who’s there? Woo. Woo who? Don’t get so excited, it’s just a joke. Knock, knock. Who’s there? Anita. Anita who? Anita to borrow a pencil. New from Zonderkidz, here’s a collection of knock-knock jokes that’s both hilarious and wholesome. Lots of Knock-Knock Jokes for Kids is sure to send every kid you know to his knees in a breath-stealing, side-splitting, uncontrollable fit of giggles—it’s that funny. And with more than 350 jokes, the laughs are sure to never quit. This collection provides fun for the whole family and includes bonus Q&A jokes and riddles too!